"I really want to be in a sequel!" 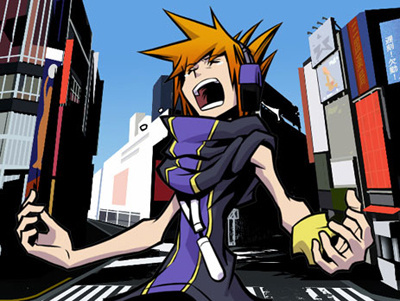 Square Enix's The World Ends With You is, let's face it, pretty sensational: innovative, individual and impossibly stylish, it's received critical acclaim since launch. Like many great games, however, the question of a sequel looms over it like an irritating Noise: Tetsuya Nomura, the game's designer, wants to see a sequel, and he's not afraid to say so. I’m really happy that the game was so well received in North America. I definitely want to make a sequel. I’m very busy working on other titles right now, but when the time is right, I would love to make another instalment of The World Ends with You. Although currently busy with several Final Fantasy projects, the fact that Nomura wants to create a sequel to one of the DS's best-loved RPGs is tantalising indeed, so perhaps we could see a follow-up on 3DS within a few years. Hope another one is made. It's got plenty of potential. To heck with FF, it doesn't need to be anything to do with the first game, as long as it uses a similar art/music/gameplay style, i'll be day 1'ing it for sure. This is still my favorite DS game. Ill past on this one. The only thing a TWEWY sequel would need over the original is for clothing changes to actually affect characters' appearance (they did it for Dragon Quest IX, after all). Oh, nice! A bit of a stretch for the pun in the subheading, but it worked! Still don't know how I'd feel about it. I kind of want it to remain a one-shot. A glorious, fantastic, heart-wrenching one-night stand with Nekky. Hmmm.... this sounds oddly familiar. I know a handsome fellow who mentioned this too..wait a minute! Like I said before, I would love to see a sequel. Since there was a good Super Mario Galaxy 2, there can be a good The World Ends with You 2. Make it for the 3ds because you can. Please, PLEASE release the sequel for a console platform! It deserves better than another handheld entry. Please DON'T release it for a console - it'll be $20 or $30 more expensive then. The first game was great and i only paid 15 bucks new for it. If the sequel does come out, I assure you that Neku and co. will not participate. There is little to no reason for ANY of the characters to exist in the new game, actually. Now i see why there was so much hype for this game. As I've said before, I think 1 was enough. WOW! it really makes me SHOCK! let's make it in 3DS!